A world of taste & textures in diverse offerings. 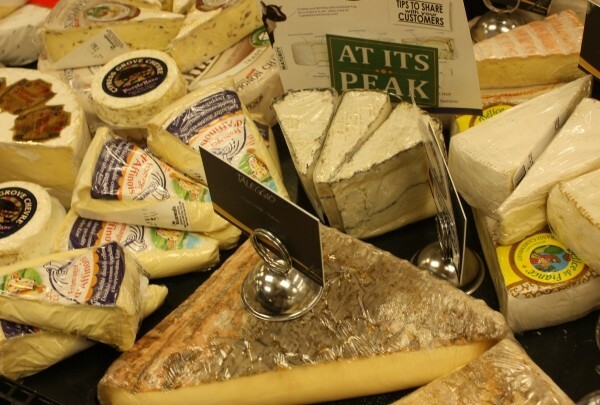 Gourmet cheese counters are growing in popularity, with most offering over 50 varieties. up in grocery stores. Conversations about different varieties now mark the cheese snob who once may have given the same attention to wine. “[Gourmet cheese is] one of our signature products, a best-seller. People don’t seem to mind that it can cost more than $20 a pound,” says Fou Sua, cheesemonger at the Taylorsville Harmons location (5454 S. Redwood Road, 801-967-9213, HarmonsGrocery.com). The grocery chain features a wide selection of cheese, with a dozen types of cheddar and even more types of Gouda and blue, plus many other selections. Cheese is one of humanity’s oldest nonmeat foods. It’s mentioned in the Bible, where David is told by his father to take a gift of 10 cheeses to a military commander. In A.D. 79, philosopher Pliny the Elder wrote of the delicious flavor of blue cheese. Sua says mold will happen on cheese, and it’s no problem. “Just scrape it off and eat the cheese,” he says. However, when buying, he advises selecting slices that don’t already have mold or cracks, and ripened varieties that aren’t mushy. He says the best type for a gourmet cheese virgin is a havarti, because it’s not too strong and not too weak. If you’re deliberating whether to pay $10 for a kind you’ve never had, ask the cheesemongers for a sample. They won’t mind giving you a taste. Some cheese facts: Goat- and sheep’s-milk cheeses are stronger than those made from cow’s milk. The white rind that appears on some varieties is edible. Grated cheese will lose flavor quickly, so purchase whole pieces and grate as needed. To keep cheese fresh and unmoldy, keep air away from it and refrigerate. Plastic wrap makes a good seal. Some varieties go well with fruit, others with wine. Cheesemongers, like butchers, know their product, so ask questions.